Guthrie's 89er Days celebrates the Land Run history of the town with fun events and activities. 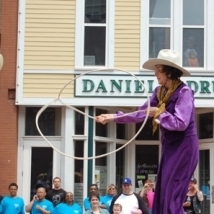 The annual 89er Days Celebration commemorates the Land Run of 1889 and the birth of Guthrie. On April 22, 1889, tens of thousands of excited Victorian-era land seekers lined the borders of the Unassigned Lands of central Oklahoma in preparation for the first of five land runs in the state. By nightfall, Guthrie had grown from a sparsely inhabited patch of prairie and timber to a bustling tent city of over 10,000 people. Come celebrate this historical event with fun activities that celebrate this bygone era. Visit http://www.travelok.com/listings/view.profile/id.18212/type.event for information and list of events.